Apples and honey: as I launch Neesh Noosh just days before Rosh Hashana, the Jewish New Year, I thought it would be appropriate for my first entry to be a simple dish. Rosh Hashana (head of the new year) celebrates the creation of the world. We are about to enter the Jewish year of 5775 for the world. What does a plain dish of sliced apples, dipped in honey, have to do with the awesomeness of the creation of the world? And why the seductive fruit that played a pivotal role in the future of the world and humanity? The simple answer to all of this is that apples and honey are eaten at Rosh Hashana meals after saying a prayer, that asks God for a sweet year. Originally from Central Asia, there used to be thousands of varieties of apples. By the time I was a kid, it seemed like the only apple options were mealy, bland Red Delicious or tart Granny Smith green apples. That was then. 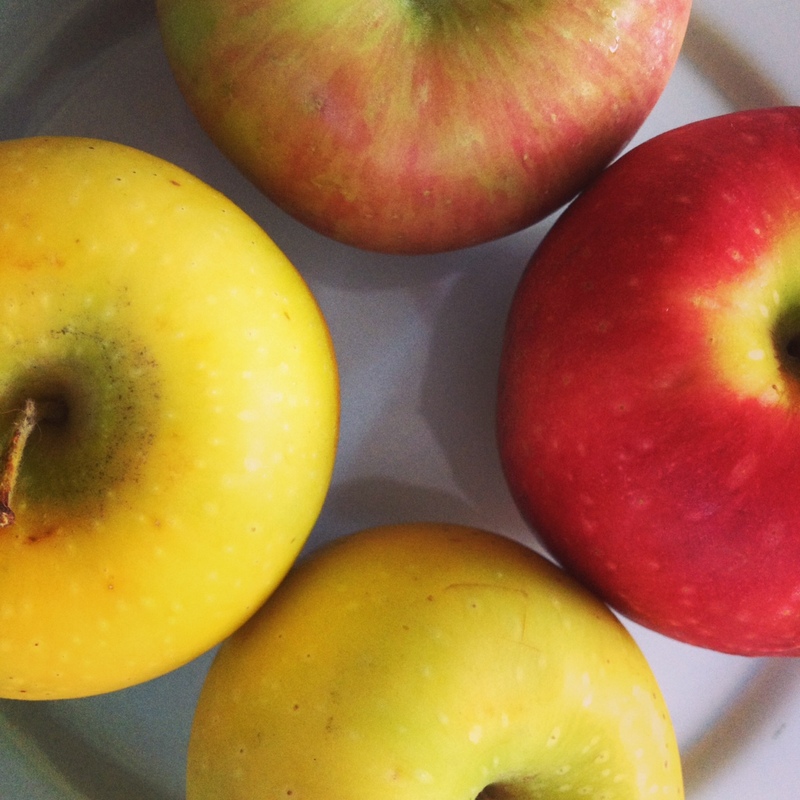 Now, there is a concerted effort to grow and consume many of the amazing heirloom apples. Despite the dwindling number of apples, fortunately there are 3,000 types still in North America. 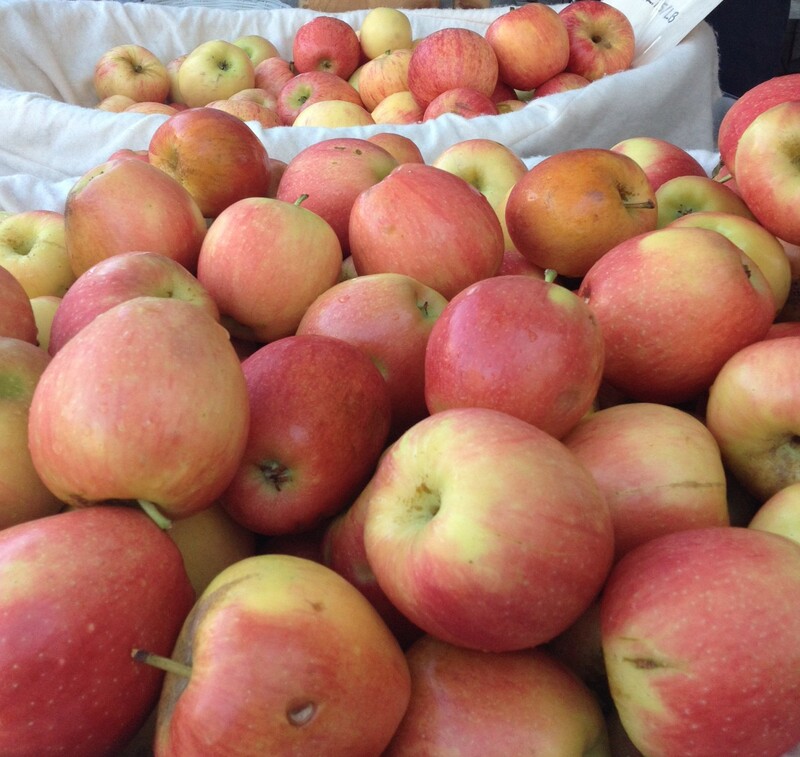 From Aceymac to Zuccalmaglio’s Reinette apples, there’s a new one for you to try. If you want to learn the history of apples, I suggest you read Michael Pollan’s The Botany of Desire: A Plant’s-Eyed View of the World. Honey is the nectar of life. Honey bees are responsible for pollinating every third bite of food we eat, amounting to $15 billion in US crops annually. Due to industrial agriculture practices, honey bees are under threat. Colony Collapse Disorder, the global phenomenon of honey bee die offs threatens the delicate ecological balance of our food systems and environment. There’s much we can each do to address it, including buying honey from a local bee keeper. On Rosh Hashana, we hear the wails of Hagar, through the sounds of the blowing shofar. Eating apple is like hearing her wails. We remember the pain and suffering that was unleashed unto the world with the first bites of the apple, in much the way that Hagar suffered. When the apple was eaten in the Garden of Eden, it opened up to humanity the ability to see and hear the pain in the world. We each hold honey and apple in us; we can look at the painful realities in our own lives and in the world. The dab of honey is a reminder, though, of the hope, beauty and joy, that can come into the world despite the potential bitterness and sorrow. Rosh Hashana celebrates the awe-inspiring radicalness of the creation of the world. Our lives are humble and simple, too, living in respect of the greater universe. We each–like the slices of apple–are each tiny parts of this creation, with our unique gifts to share. Our collective slices, together, are our opportunity to celebrate, honor and share in the opportunities of creation we are offered. And we each have temptations and opportunities live Chava (Eve) and Adam in the Garden of Eden. The apple is also a reminder of the negative, destructive behaviors we could each unleash in the world. We hear the wail of Hagar during Rosh Hashanah, through the sounds of the shofar. The apple can be our edible wailing, too. From the Garden of Eden to today, the wails are a reminder of the pain and suffering in the world despite our celebratory holiday. I hope your bites are humbling, sweet and inspiring as we embark on a new year. slice. dip into honey. enjoy! This entry was posted in Appetizer, Fruit, Holiday, Rosh Hashana and tagged farmers market, gluten free, honey bees, Jewish food, kosher, paerve, Rosh Hashana, Rosh Hashanah, vegan by Sarah Newman. Bookmark the permalink. I love the religious background you provided on this. Very rewarding read with lots to chew on (pun intended). Thank you! Enjoyed reading! Now I think I will go and eat an apple! It’s so great to be able to follow you now from your farmers’ market shopping to your blog’s featured recipe! If more people shopped in their neighborhood, supporting the efforts of a sustainable healthy community, they’d realize how natural and rewarding it is. You’re a great example of that person Sarah, and it shows in your writing and lifestyle. Thank you Sarah, although I am preparing myself this recepy for Rosh Hashana, your little touches and of course the recommondation to use apples from the right origin makes it look much better. I’l remember this. Shana Tova.